San Antonio Pop Warner Little Scholars provides three different programs including football, cheer and dance and is a youth organization in San Antonio that requires it’s participants to maintain academic excellence combined with the virtues of teamwork and sportsmanship! With 4,000+ participants and over 8,000 volunteers in 16 organizations spread throughout out Greater San Antonio, San Antonio Pop Warner is one of the largest leagues of the Southwest Region Pop Warner Football Conference. We have consistently advanced teams in football, cheer and dance to regional competition and many of the teams go on to National competition at Disney World in Orlando, Florida on a yearly basis. 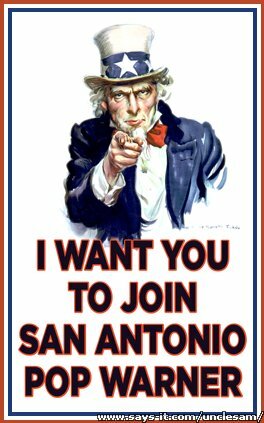 San Antonio Pop Warner continues to grow along with San Antonio and its surrounding areas to meet the communities needs and offer an opportunity for young athletes to learn and excel in sports and personal achievements with rewards offered unlike any other local youth sports league.